DLR researcher Christoph Kölbl controls the first mock-up over the Vineyard. A change from his development work in the laboratory and on the computer: DLR researcher Christoph Kölbl controls the first mock-up, which is not yet functional. A buzzing noise fills the summer air above the Heilbronn Weingenossenschaft vineyards. 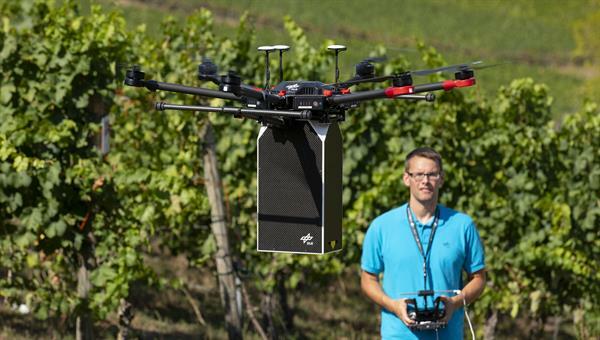 The source – a small remote-controlled hexacopter hovering a few metres above the vines. Hanging below it is a black box – slightly larger than a shoebox – that contains a laser-based detection system. 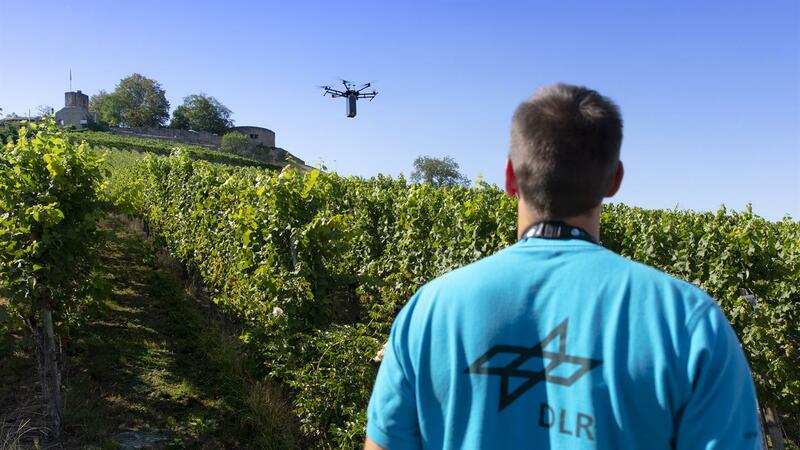 In future, researchers from the German Aerospace Center (Deutsches Zentrum für Luft- und Raumfahrt; DLR) aim to use this to detect fungal infestation in vineyards at an early stage, in order to prevent crop failure and reduce the use of agricultural chemicals. Scientists from the DLR Institute of Technical Physics in Lampoldshausen are currently in the middle of the development phase: they are working on making their concept airborne – that is, demonstrating the feasibility of their approach and determining how accurately and sensitively the system can take measurements. "Our aim is to have a compact, affordable system at the end of this development process. This should enable the comprehensive, systematic examination of large cultivated areas and detect any infestation as early as possible," summarises Christoph Kölbl from DLR. The researchers must therefore address three challenges: the detection system should function faultlessly and with optimum accuracy, while being lightweight and airworthy, as well as capable of being implemented at economically acceptable costs. Drone-based systems are already being used in agriculture: for example, to apply agricultural chemicals in a targeted manner or determine the ideal time to fertilise or irrigate. In viticulture, fungal infestation in particular causes a great deal of damage. The affected grapes must be laboriously removed during harvesting. The quality of the harvest suffers, as does the economic yield. In order to prevent the spread of a fungal attack, it is important to detect and control it at an early stage. In Europe, approximately 60 percent of all anti-fungal agricultural chemicals – so-called fungicides – are used in viticulture. "If disease is detected as early as possible, more targeted countermeasures can be taken, confining it to a specific area. This reduces the cost of spray agents, protects the environment, and above all improves the quality of the wine," says Kölbl. The DLR scientists are using the active fluorescence detection method: an optimised laser emits invisible laser beams that are harmless to both animals and humans. These hit the vines and trigger a fluorescence effect – not discernible to the naked eye – thereby illuminating the surface. The scientists detect this illumination – or physically speaking, the backscattered fluorescent light – using a spectrometer specially developed for this application, the second major component of the detection system. This analyses the backscattered light spectrum, which varies depending on whether the vine is healthy or infested with a fungus. The everyday research of Christoph Kölbl and his colleagues in the 'Atmospheric Propagation and Effect' Department involves laser applications in the atmosphere, focussing on the potential use of laser beams over long distances. For example, they develop and test technologies for laser systems that can be used to detect and identify pollutants and hazardous substances from afar. "Their application in agriculture is a bi-product, a spin-off, of our research", says Department Manager Frank Duschek.